It wasn't the news we'd hoped for. Brian, 15, had already been through so much. In the past two years he'd nearly died over a dozen times. He was in the hospital more than at home. I stared at his lifeless body, hooked up to so many tubes, wires, monitors, and I.V.'s. Tears streamed down my cheeks. Here it was a week after his 5th open-heart surgery and he still couldn't breathe on his own. Normally he'd bounce right back. Not this time. When they tried to take the ventilator out, he flopped like a fish. I told the nurse right away. "That's not normal. He doesn't usually breathe like that. Something's wrong." But she insisted he'd be fine. Later, they took an x-ray. "His diaphragm was paralyzed during the surgery and now it's pressing up against the right lung," the heart surgeon said. "Usually the diaphragm will come back and begin working on its own. We'll give it a few days." But later that day, Brian's heart rate dropped down to 23 and they nearly lost him. Apparently the special mapping they tried to do during the 16 hour surgery hadn't worked and his rhythm problems were even worse. "We'll need to perform emergency surgery," the surgeon explained. "It's risky, but he needs a pacemaker and he needs it now. Once they get that placed, he'll have the other surgery on the diaphragm." Three major surgeries in one week. Wow! He was already in such a weak, critical state. All any of us could do was pray. And we prayed hard. Brian was born with only two chambers in his heart. At that time doctors had told us he'd only live to be a year old. Although he'd been critically ill for the first two years of life, he had surpassed all the odds. And by the time he turned three, he was raring to go. He rode his bike, rollerbladed, and swam like a fish. Then, at 13, all of that suddenly changed. He started getting winded just walking up a few stairs, and had to stop frequently while we were out on family bike rides. His heart, we learned, was only functioning at 40%. They claimed he needed another surgery. I figured, he'd have it, get better, go home, and he'd be as good as new again. Sadly, after that surgery at 13, his condition only grew worse. No one in the family had a clue. No one that is, except for our formerly abused, rescue dog, Snickers. He would not leave Brian's side for a second. He slept in his bed at night, stayed with him during the day on the couch, and even followed him to the kitchen. "You know the rules," I scolded. "Now go lay down!" But Snickers was persistent. He hovered right by the doorway to the kitchen on all fours. His eyes fixed on Brian. I was starting to lose my patience with that dog! Just as Brian tried to eat his macaroni and cheese, his head flopped onto the table. With bright red cheeks, sweat dripping from his forehead, and hardly able to speak he gasped, "I can't breathe!" While I ran to the phone to call 9-1-1, Snickers ran to his side and stayed there until the paramedics arrived. I was surprised to find the macaroni and cheese still on the plate at the edge of the table when I grabbed my purse to follow them out. That's when I realized Snickers wasn't interested in the food at all, he was concerned about Brian. He knew long before I did that something was wrong and he was trying to tell me. Brian continued having close calls and bouts with tachycardia (heart rate above 200) and even bradycardia (heart rate under 50). Again, during that two year time span, Snickers rarely left Brian's side. Strange, Snickers had ran under my van a few months before Brian got sick. I had said we would only keep him for the night. Back then I tried everything to get rid of that dog. I called the pound, they were full. I tried to lose him on a walk, he found his way back. I placed an ad in the paper, and by the time his real owner called to claim him, I was totally and hopelessly in love with him, as well as my entire family. Thankfully she allowed us to keep him. But never in a million years would I have imagined what a huge healing role this new member of our family would play in Brian's healing. Back in the waiting room at Detroit Children's Hospital, the surgeon finally came out. "Everything went well," he said. "The pacemaker's in, the diaphragm fixed, and Brian's in recovery. You'll be able to see him soon." We couldn't have gotten better news. We hadn’t been home in nearly a month, and I knew we needed to pay bills. So, after seeing that Brian was stable, we went home to take care of business. I decided while we were there to make a family video for him. I went all over to see his cousins, grandparents, aunts, uncles and taped everyone I could think of. I even did a small clip with Snickers. When we returned to the hospital, things didn't look good. They had weaned Brian from the ventilator, but now he was hacking and coughing uncontrollably, from the fluid on his lungs. He began vomiting too. The doctors ran more tests. With those tests came more bad news. "I'm sorry," the doctor said, "but your son has Pancreatitis." He explained that it was an inflammation and infection of the pancreas and could be quite serious, especially with Brian's underlying heart condition, and all the surgeries he'd just been through. They went on to say that he might not pull through. Every day was touch and go. We soon learned the only way to cure pancreatitis is to not eat and wait it out. Brian hadn't eaten for nearly three weeks. When I told him he couldn't eat, he cried and begged me to take him home. "I just want to see Snickers, please," he said in between coughs. "Can't I go home, please?!" "I know, honey," I said, giving him a huge hug. "I want to take you home to see Snickers too, but you need to get well first." At that moment I felt totally helpless. Later that day I remembered the video I'd made. I thought it might cheer him up to see everyone. So I plugged it in and pressed play. He didn't seem too enthused by it at first, until it got to the part about Snickers. When he saw Snickers sitting on his bed, wagging his tail, tears rolled down his cheeks. Within twenty-four hours of watching that video, Brian's condition greatly improved and he was moved out of ICU. One week later he was even discharged from the hospital. Our three kids threw him a huge homecoming party. All our close relatives were there. When he opened the door they all yelled, "Surprise!" But the best surprise Brian got was Snickers bolting to the door, so excited to see him, he licked his entire face. I'm not going to tell you that life has been perfect for Brian or us since then. Actually there have been some really rough times. 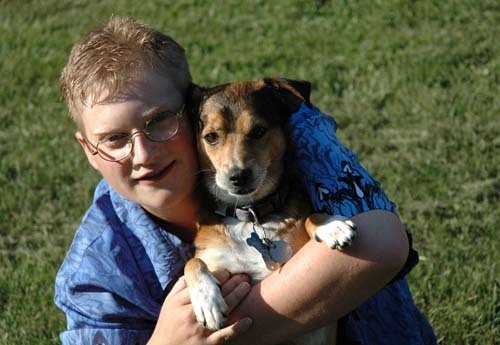 Brian was on the heart transplant list for five years, but thanks to Snickers, he became fairly healthy and lived at home most of that time. At the age of 22, Brian was healthier than he'd been in years! He was working out at the YMCA a few times a week, walking Snickers around the neighborhood every day, and he'd even lost 42 pounds! Sadly, Brian suddenly passed away one morning due to a blood clot in his leg. But even then Snickers was right by his side comforting him. He even attended the visitation and funeral, giving love and affection to all who were there. 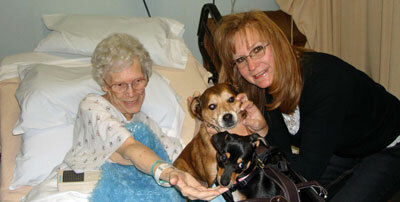 I know now with all my heart that Snickers was born to bring healing and comfort to others. I'm so glad he chose to run under my van that day! 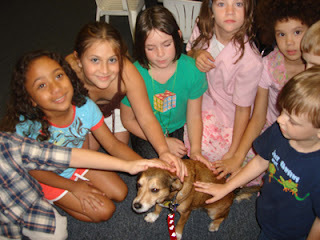 Snickers has been a Certified Pet Therapy Dog through Therapy Dogs International for seven years now. He's won numerous awards for his therapy visits, raised over $20,000 for needy and abused people and pets, but his greatest gift to others is that fact that he continues to heal hearts everywhere his paws go.